Heat 1 tsp of oil, add ginger & red chilly. Then add mint leaves and corriander leaves & cook for 3 mins. Allow them to cool. Grind them with salt & keep aside. 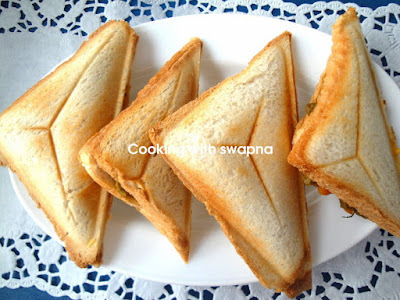 Take the bread slices, spread the butter first & then tomato ketchup in a single slice. In the another slice of bread, spread the mint paste. Serve them warm with tomato ketchup. 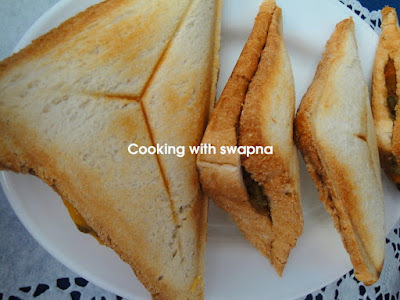 I too make this swapna but the mint chutney is different ingredients i use..this is looking diff i will try it out next time and I love sandwiches of anykind so pass to me. Ur header is fantastic too dear. Hey Swapna for some reason I am not able to see the picture and everytime I open your website it diverts me to my homepage.... I am not sure if the prob is in my laptop or with the webpage!!! but I did manage to read your receipe, mint leaves and cilantro mmm sound be aromatic and a healthy breakfast!!! That is a simple and yummy sandwich! Simple and good. In the west sandwhiches are a popular diet and usually lettuce is added for both nutrition and taste reasons. Cheers !! !